We are pleased to note the subject matter. It features a very moving Antique medal with a representation of Saint Joan of Arc. The detail is raised and stunning in person with her profile and Fleur de Lis, the French symbol of Royalty. The reverse is dated 1904, Marthe and has Thistle, indicative of the region where she was born, Lorraine. She is crafted in Sterling Silver and is marked "Argent", sterling in French. 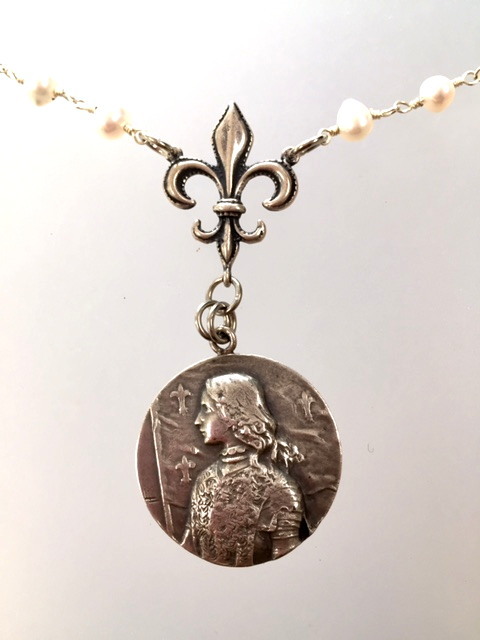 I suspended the medal on Genuine Freshwater Pearls and a Fleur de Lis charm. The medallion is 1" in diameter, pearls are 34" long, can be adjusted if need be. ï¿½I am sent here by God the King of Heaven.ï¿½ She was canonized as a Saint on May 16th, 1920. If you collect French antiques or are seeking a unique GIFT, look no further.